I love doing dives around 4pm in Marsa Shagra. That’s the time where the big schools of fusiliers seem to come out. Sometimes, you are completely surrounded by a complete wall of these fish. On this particular day, the schools were very dense. I shot several pictures. 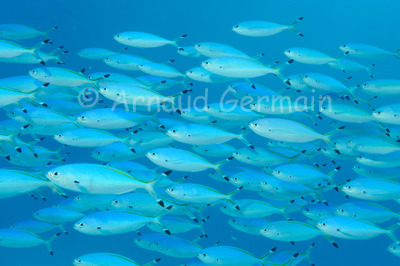 In this one, you can see how schooling behaviour can really confuse a predator as the fish swim so closely together that it is difficult to single out individuals. Nikon D700, Nikon 28-105 mm macro at 28mm, F8, 1/60th, ISO 400, Ikelite Housing and Ikelite DS160 strobe set on TTL +0.3EV. Marsa Shagra South House Reef, about 10 metres down, Marsa Alam, Egypt.